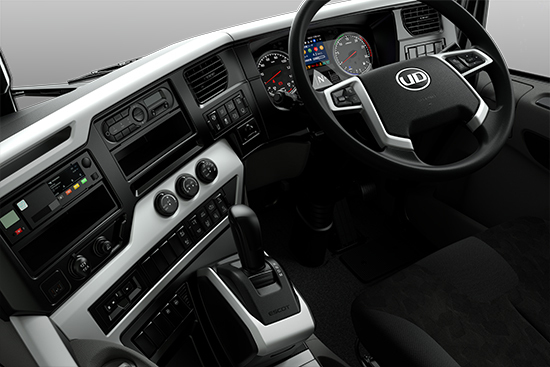 With innovation that puts people first, our next generation of trucks feature design enhancements in five major area. "ESCOT-Ⅵ" – the latest evolution in 12-speed automated manual transmissions, plus disc brakes and an interior designed for driver comfort, deliver a sophisticated driving experience that reduces driver stress and fatigue. 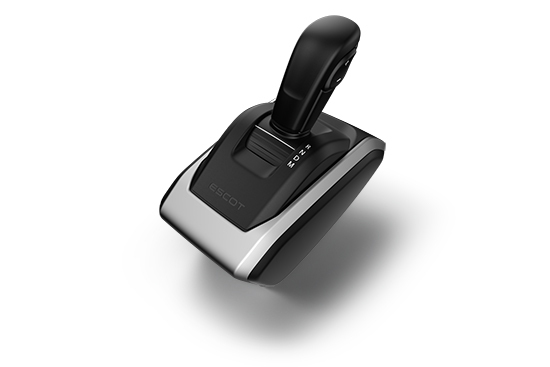 "ESCOT-Ⅵ" provides highly-evolved hardware and software control to ensure professional driving performance. With its advanced and accurate gear changes and smooth fuel efficiency, ESCOT-Ⅵ eases operability, reduces levels of stress and fatigue while driving, and contributes to driver safety. Performance is further improved on snowy roads and in muddy areas. The ESCOT-Ⅵ gear lever uses a straight shifting pattern, an evolution in its simple and easy-to-use design. ESCOT-Ⅵ’s gear change is really exquisite. On a trial ride with a virtual load, I was even wondering “Am I really carrying a 10-ton load?”. 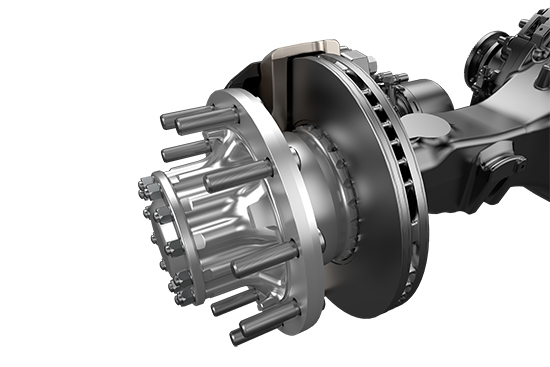 Whether it is the transmission, or the new brakes, all respond perfectly to the driver’s will, and can’t be qualified by a word less than “wonderful”. Our Quons are currently manual, but after discovering its level of performance, I think we need to seriously consider acquiring automatic new Quons. Atsushi Miyazaki, Senior Executive Officer, Kyoshin Construction Transport Ltd. This system maintains a fixed distance from the preceding vehicle, detected by a millimeter-wave radar. If the preceding vehicle accelerates, the truck will accelerate within the range of speed that has been set. 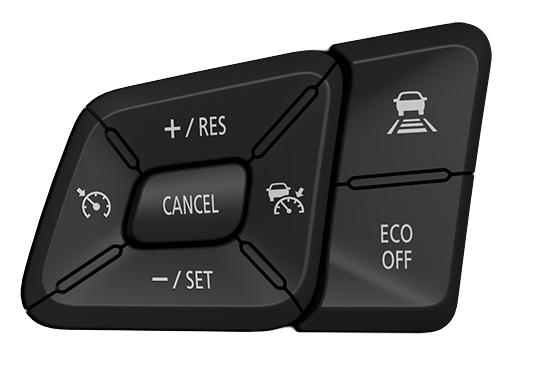 The driver can set the speed and distance between vehicles with the switches on the control panel. A speed of 30 km/h or higher can be set. If the speed of the truck falls below 15 km/h, this function is cancelled. 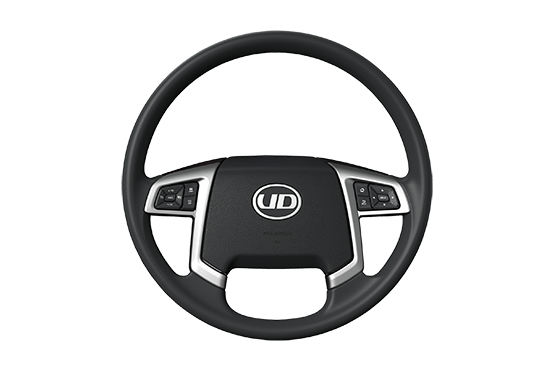 The shape of the steering wheel has been ergonomically redesigned for a more comfortable grip that reduces driver fatigue. Switches are conveniently positioned for easy access to functions and information, and the driver's line of sight and operation line are on the same plane for efficient, safe, and reliable operability. The newly designed instrument panel is loaded with driving information and LED indicators arranged in an easy-to-understand way. Information is displayed in zones arranged according to warning priority, with essential information at the top. A large, 5-inch color LCD multi-display monitor occupies the center of the instrument panel, with fonts and layout designed for easy visibility. 1. Easy-to-read font size, easy-to-see symbols and gauges. 2. Multi-display, controlled with switches on the steering wheel. 3. Classy design featuring silver rings. 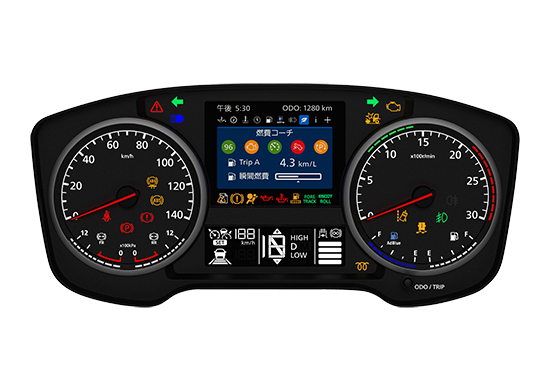 We have designed a sleek black and silver dashboard that skillfully combines straight lines and curves, to enhance driver operability and visibility, and to provide optimal arrangement of the multi-display monitor, switches, equipment, and instruments. Switches are set to light up when in use and to light up at night time, so that all switches can be easily understood at a quick glance. Disc brakes are available on all models for quick and smooth pedal response, and reliable braking even on long descents with a full load. By combining a variety of advanced systems, such as brake blending and an Emergency Braking System (EBS), we have achieved braking comfort that reduces driver fatigue, and is also easy on cargo. To me, the new gear lever adopting a straight shift pattern and the switches arranged on the steering wheel are a big factor leading to the ease of operation of the new Quon. In the test drive this time, the “brake blending” perfectly blended the auxiliary brake with the foot brake, and I was able to experience stable and reliable ideal braking. I’d like our drivers to also experience this exquisite effectiveness.